So, I was technically “Wanted” and in the middle of the black, I couldn’t dock and clear my name at the only station for thousands of light years due to some dodgy guy not letting me access the station’s services. I was still trying to work it out. Was it a misunderstanding combined with an overzealous, by the book port administrator or did I stumble across something I shouldn’t have. That black unmarked anaconda was suspicious for sure and since when was taking photos at a port a crime. It was an independent system and star port run by the Colonia Council, not some secure imperial or federal military base. I checked my photo log and the photo wasn’t there, neither were at least two others. Either my drones had malfunctioned, or someone had deleted them. My main issue now was that I was wanted and would not be able to use station services from here on out. Not a big deal as there are only a few more outposts this far from the bubble. My concern was that when we get to the galactic core, I would not be able to dock and contribute to the mining effort to complete the new station, and worse, there was a real risk of me getting attacked by security forces. I needed to clear my bounty. I interrogated the galactic map for over an hour, looking up outposts I had past and those in front of me, but none seemed viable. I contacted Canonn. Their response was that they can not have communication with a wanted commander and suggested I visited the nearest detention center to argue my case and I quote; “they will help you”. With emphasis on the “will”, strange I thought, but the fact that they managed to sway the smartly dressed man back at Sacagawea and got me out of that situation I saw no reason to not act on what they said. The nearest detention center was Mjolnir's Wrath in Nyeajaae VU-Y a27-9 which was over 4000 ly away back the way I had travelled. 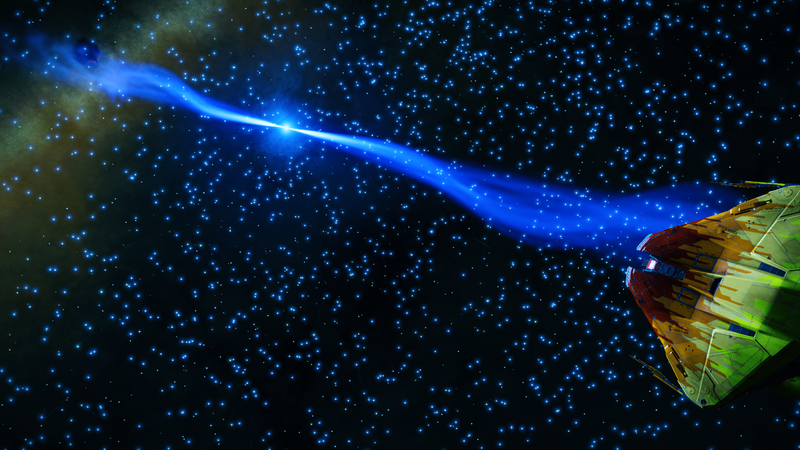 I then got thinking; Neutron stars, those violent blue stars with their twisting cones of radiation that I had encountered a few times now. Could I really do what only 3 weeks ago I thought was crazy? I did say never say never. After speaking to my pals at fleet comm, taking notes and installing some new software that I was sent, I plotted a "Neutron Route". 22 jumps instead of nearly 90 standard jumps. I was as prepared as I could be, drank a strong mug of caf and jumped to the first Neutron. Straight away once I jumped into the system my brain was telling me this was a bad idea, but I heeded the advice given and just powered back my throttle, so it was barely off the stops and approached in super cruise. I adjusted yaw and roll and angled into one of the cones half way down out of the exclusion zone with my back to the star. As soon as my ship entered the blue swirling light I felt the gravitational forces start tugging at the ship, it creaked and rattled, a rumble filled my ears and I felt my teeth start to vibrate in time to with my vision. I concentrated and stared at the centre point in my HUD, wrestling with the flight stick to keep the ship from being flipped backwards, waiting for the message. “Warning FSD Operating Beyond Safety Limits”. Yup, I know, I know, I thought. A few more seconds past which felt like minutes, then “Frame Shift Drive Supercharged” appeared. I went full throttle and aimed out of the cone whilst still spinning. The spin and noise quickly subsided, and I checked my module status, all showing 100% and my FSD range was now showing 270 ly! I laughed at that and proceeded to plot my jump to the next system 264 ly away. I did this 22 times, briefly detouring along the way to fuel scoop main sequence stars to keep my tanks topped up before arriving at Nyeajaae VU-Y a27-9 and Mjolnir's Wrath.